The ATU, sorry Graham, AMU (Aerial Matching Unit) is an integral component of my all band HF dipole. After talking a number of hams and having an exploration of the internet I finally made the decision to construct Lloyd Butler VK5BR's version of the Z-Match. 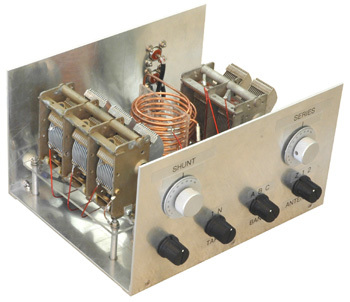 Lloyd's web site describes a version of the Z Match designed for High RF Power, which is suitable for the maximum 400 watt Australian amateur power limit; this design also featured the ability of 160metre band operation which appealed to me as my HF transceiver was capable of working this band and of cause it's another band to explore! Operational over the entire HF band. Acts as receiver band pass filter, attenuating strong signals on adjacent bands. I'm sure that there are many more additions to the above list that could be made. My opinion is that there is little against the use of AMUs. While it is not a simple flick of switch to change bands it is still very straight forward and will require less that a minute to change bands and retune once practiced. While there can be some additional losses within the AMU, this is negated in most cases as the use of open wire feed line is much lower loss than coax particularly when high SWR are present on the system. Also the transceiver will in most cases see a perfect 50ohm load and be a lot happier. The main factor that determines the final power rating is spacing of the variable capacitor plates, and as I only intended to run around 100 watts I selected two broadcast type variable capacitors with little concern for the plate space. This was a big mistake as there appears to be always one or two bands that generate voltages up towards the kilovolt across the capacitors. The result was sporadic arching on the both variable capacitors. The project was redesigned with the largest broadcast type variable capacitors that I could locate and the transformer coil was redesigned with the ability to switch in more turns to the secondary winding. The performance has been almost faultless despite both variable capacitors experience some arcing at 100 watts on two bands. However with the ability to switch in alternate tap positions this problem is over come and operations on all bands is achieved. An interesting operational note is that tapping in more secondary turns is not always the solution. In some cases the arching is over come by tapping less turns. Treating the coil as a simple transformer is not as straight forward in a resonant situation I guess. The 160metre band has been trialed and despite the successful performance of the Z-Match the short dipole is very inefficient at this frequency resulting in a limited number of contacts. For operations below 10 MHz particular care is needed in relation to the power handling capabilities that is manifested as arcing across the capacitor plates. The solution to the capacitor arcing may be resolved by selecting the ideal tap position. A related issue on the lower frequency bands and in particular the 80 and 160metre band is the very high Q that the matcher exhibits. This allows the matcher to operate over a very narrow range of frequency before require further retuning. Again the 80metre band requires retuning after a frequency shift of less than 20 kHz. The below chart illustrates this effect. At least the occasional knob twiddle makes you feel like you drive the station! The below chart is used to guide the operation of the Z-Match but of cause will be unfortunately different for every antenna system including the feed line that it is connected too. But it serves to indicate that once the operational experience is recorded in a convenient form it is not too onerous a task to hop from band to band. L1 and L2 Perspex Support Former. Coils L1 and L2 are wound with around 1.5mm diameter bare copper wire. The coil former is made from 3mm perspex sheet and drilled as per diagram to support the turns of the L1 and L2 coils. Note the diagram is displayed upside down. The wire size is not critical, but heavier is better. Bare copper wire was used as it was what was available. Drill holes are all 2mm. The coil support former is mounted with two right angle aluminium brackets attached to either side coil support former. L1 = 14 Turns, Tap at 7 and 10 Turns from cold end. The both sides of the C2 variable capacitor are above ground and therefore C2 must be mounted so that it is insulated from the grounded chassis. I chose to mount C2 on a small sheet of Perspex mounted about 2cm above the chassis. The C2 spindle is also connected by a short section of 6mm fibreglass rod to the control knob. Both variable capacitors have been mounted using the same technique for consistency, but with the frame of C4 being grounded to the chassis. See photos. Both variable capacitors are controlled with a 6:1 planetary reduction mechanism as operationally it would otherwise be impossible to set the correct amount C for many frequency settings. 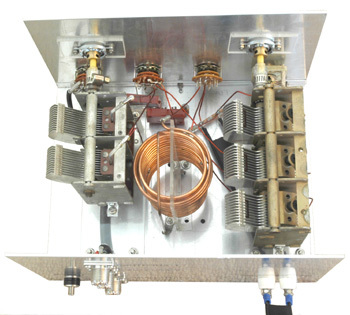 The Z-Match antenna matching unit while not exclusively designed for a balanced antenna system is particularly well suited to this configuration. A balanced antenna system requires that each half of the dipole as well as each side of the transmission line be a near mirror image and should also avoid nearby trees and structures in particular metallic structures. When the system is balanced the transmission line will have equal, but opposite current flowing in each line. This will cancel out any radiation or reception on the transmission line. The transmission line is the main reason for maintaining a well balanced system as it will be prone to radiating and receiving signals as it enters the radio room. Devices such as computers radiate noise which may find its way into the sensitive radio receiver and strong fields around un-balanced transmission feed may interfere with other sensitive equipment. A real world issue for many if not most balanced antenna systems is achieving this more or less perfect balance. Imbalance is primarily caused by more capacitive coupling to one side of the system than the other. This coupling often occurs within the matching unit its self. Lloyd Butler suggests a method to counter this effect by simply adding additional capacitance to the opposite side the system. There for I have added this feature to my version of the Z-Match. Which side requires the additional capacitance is a bit of trial and error, but a method to test for balance is to measure the current in each leg simultaneously and observe if they are equal or to simply adjust until locally generated noise reduces. 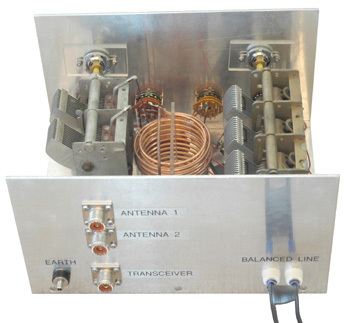 The further the problem noise source is from the antenna system the more likely it will be the antenna and not the transmission line that is receiving it and the less effective the balance capacitor will be.